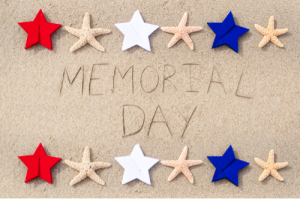 This Memorial Day Weekend, we will be enjoying our time off relaxing, barbequing, and reclining beach side. This meaningful time spent catching up with our loved ones will welcome the summer and kick off a season of outdoor activities! We look forward to hearing about everyone’s plans and hope everyone is stocked up on sunscreen, rash guards, and hats for the sunny weekend ahead of us! Most importantly, we would like to remember the men and women who sacrificed themselves to serve and protect our great nation and preserve our freedoms. Their dedication, service, and altruism embody the greatest characteristics of America, and we hope to remember these service members and support their families. Thank you to all of those who serve our country and make this weekend possible for us to enjoy!